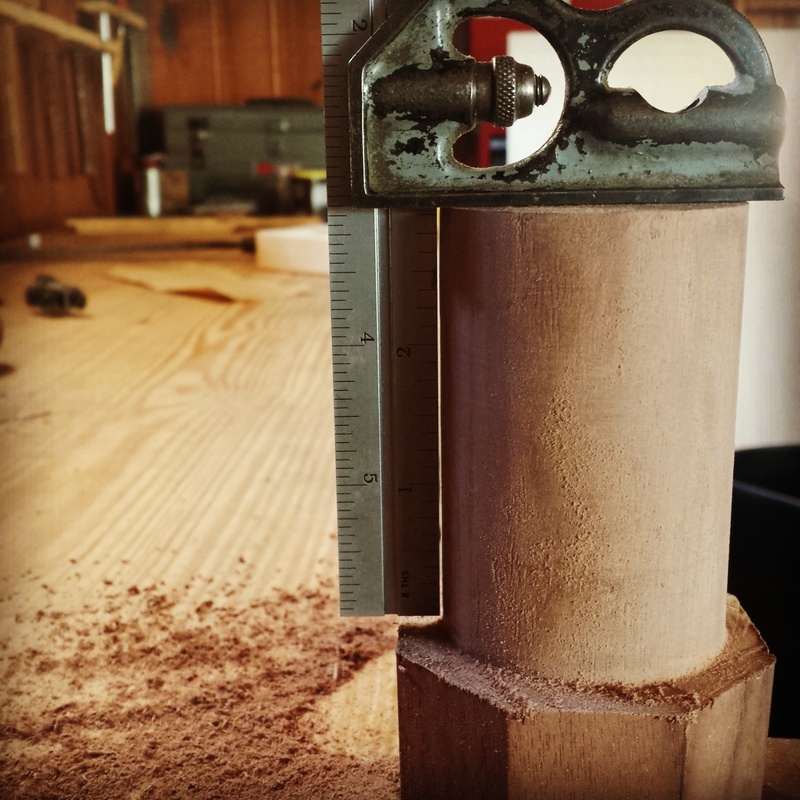 I know Chris says time and again in the text that you don’t need one, but looking at those beautifully turned round tenons I couldn’t get my heart and mind around any other way to make them. I started talking to friends to see if they new of anyone trying to get rid of one, scouring Craigslist for lathes and even hanging out in shady alleys behind lathe bars trying to score a deal. After nothing turned up through the normal channels I asked myself the question all woodworkers ask, “What would Roy do”? He’d build a German style spring-pole lathe of course, so I started investigating that. In the end, the time and energy required to build a lathe before I built the desk just led me to put the whole question off until later. Well, later is finally here. This week I had to figure out what I was going to do about making those cylindrical tenons on the legs of the staked desk I’m building. The choice was actually easier than I thought and it was practically made for me. In order to drill the mortises for these monster tenons I was compelled to upgrade my drill press setup. That meant there was nothing left over to buy a lathe, or really even to buy materials to make a lathe. 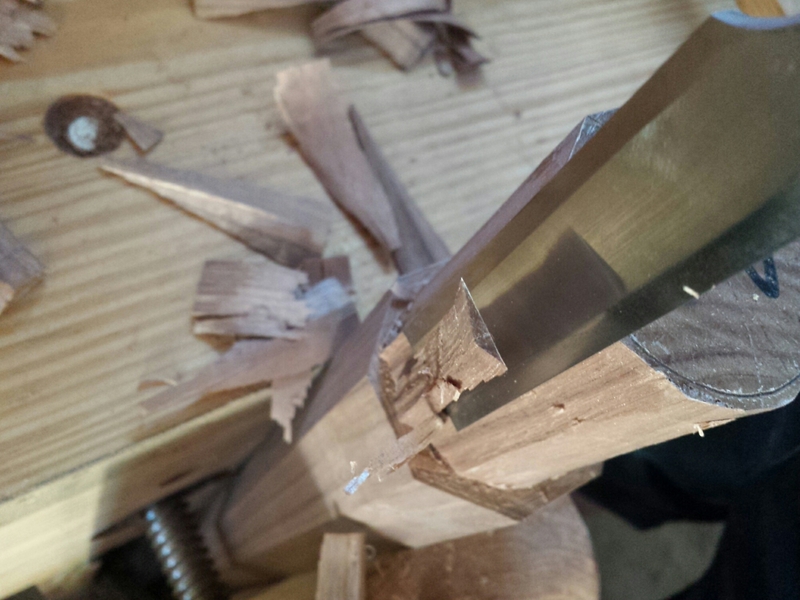 And really, I still need to properly learn how to use a lathe, so enter the saw, chisel and rasp. 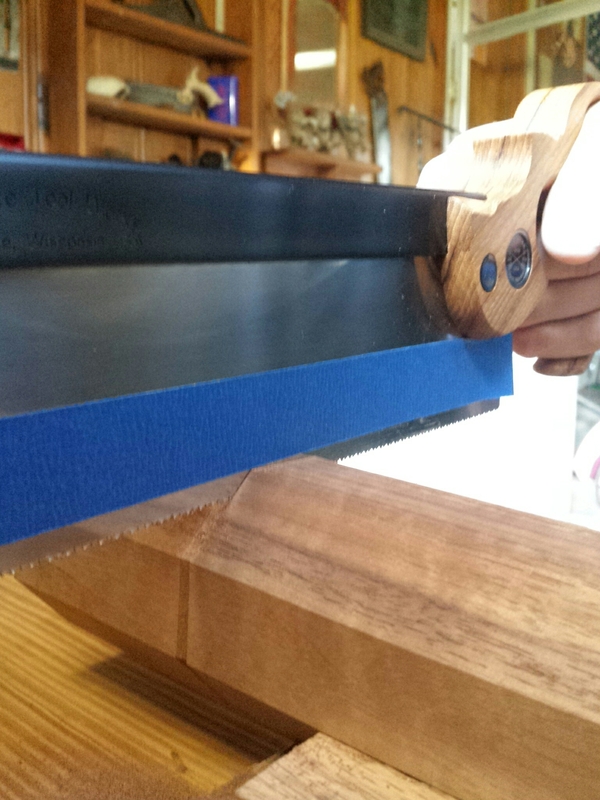 I began by marking out the wall of each tenon 3″ from the top with a marking gauge, and then chiseled a “v” at each wall to guide my carcase saw. The design calls for 2″ wide tenons and the difference between the width of the stock and the desired cylinder was 1/2″. 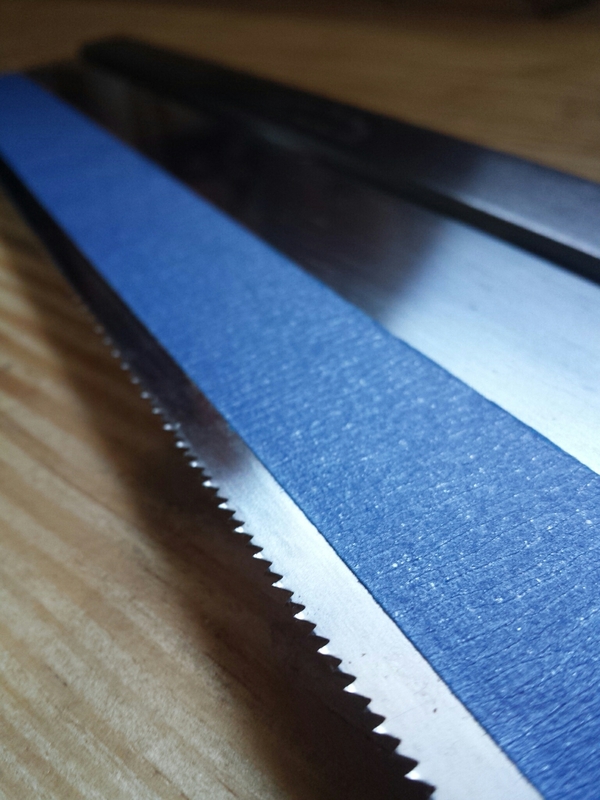 Because you’re cutting in from all facets you only need to cut half of that difference at a time, so each cut needs to be 1/4″ deep. In order to make sure I wasn’t cutting too deep and compromising the tenon I employed this high-tech depth gauge system, (otherwise known as masking tape) to mark when I had completed the required 1/4″ deep kerfs. You only need to cut the faceted faces, not at the arises between the facets. Do be careful when you’re making these cuts, but don’t over think it. Trust the saw, watch the tape, and you’ll be fine. 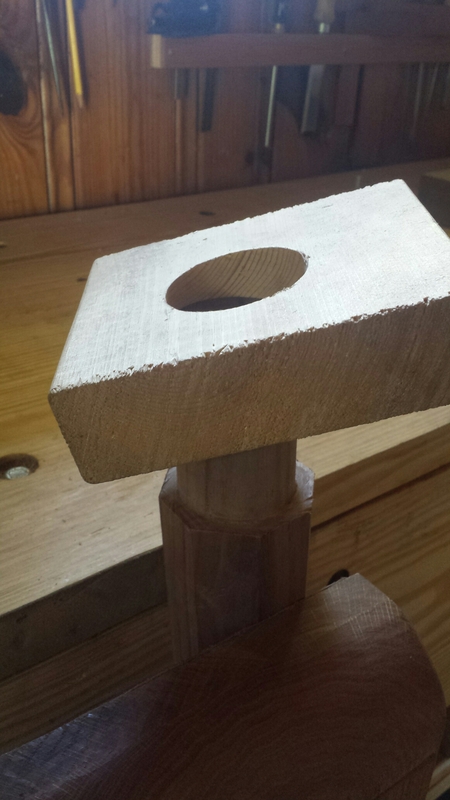 After I was satisfied with my saw work I locked the leg vertically in my leg vise and marked a 2″ diameter circle from the center point with a compass. 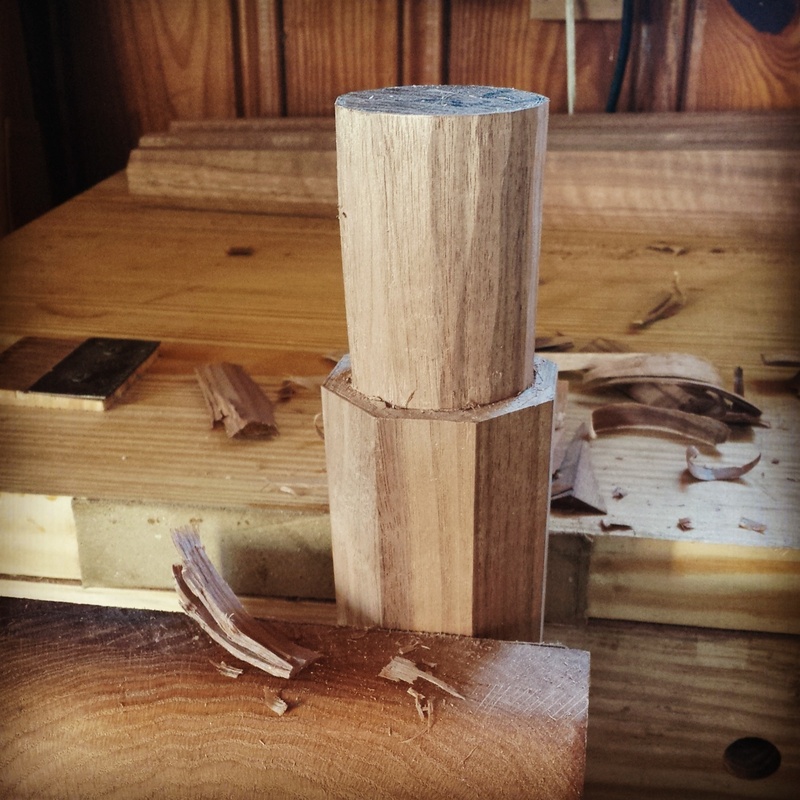 Using that as a visual guide I started chiseling away the waste making sure to stand at 90 degrees to the chisel so that I could watch that it didn’t stray too deep into the tenon. Remove the arises to create more facets and then keep working in toward the circle taking smaller bites as you approach the line. 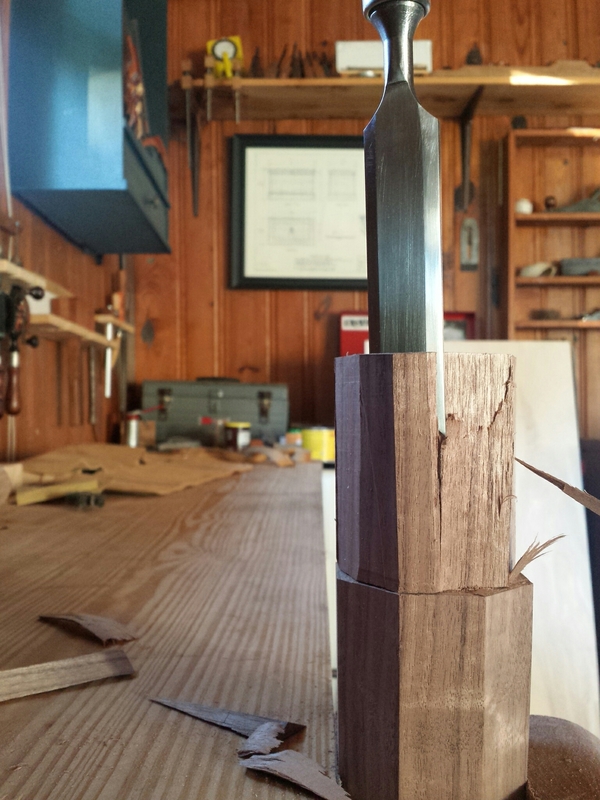 With some care, it’s possible to pare down to something fairly close to the final dimensions of the tenon. From there, I used rasps and floats to bring it down to size, constantly checking with a small combination square to make sure it was straight and square to the top which is my only real reference face at this point. In order to make sure I was on track throughout I used this off-cut of pine drilled with a dummy hole to test the fit of each tenon, fine tuning with my rasp until each tenon was snug, but easily driven with a dead-blow mallet. Now, time to put that drill press to use and drill the battens to match. Previous Post They are cheap for a reason. According to Richard, “It can be built in less than twenty minutes”. I guess you can do it without a lathe.